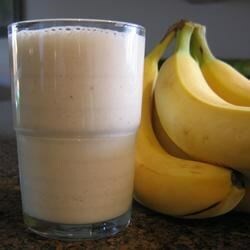 "This banana smoothie is a very nice drink on a nice summer day." Very good recipe. I omitted a tbsp. of brown sugar, water and ice, added a snack size container of vanilla pudding, and used 2 fozen bananas. Excellent. Used skim milk and left out the water; pretty tasty and refreshing. Simple to prepare. Also, added a little bit of cinnamon. This was very good! Add some vanilla! This is soo good. I only made one serving, but I used a whole banana. I didn't use quite a tablespoon of milk either. Yum! Good taste and easy to make. Kids enjoyed this drink. Thanks for easy recipe. Thanks so much! I had strep throat and without being able to eat anything for a few days I thought I was going to die! The only difference was I left the water out. Thanks so much, again!! Very Good I loved it though I thought i could have used more banana.